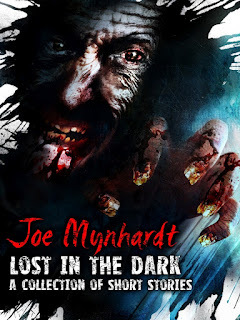 Joe Mynhardt is author of LOST IN THE DARK click HERE to buy a copy. Let me start by introducing myself. I’m Joe Mynhardt and I started writing flash fiction and short stories in November of 2008. Need I say that most of my stories are speculative fiction and just plain old horror. After over forty short story publications, I decided it was time to put together my first eBook, filled with a couple of my best stories to date. I realised I had a pretty solid base of support, readers and writers alike, and gathered it was time to really put my work out there for others to see. Pretty much in that order as well. I was immediately met with excitement, and couldn’t wait to get the ball rolling. Luckily I’m not one to rush into things, and I hope you’re not. Being a writer is about being a professional. And professionalism lies in our actions, responses and choices. And don’t forget timing. Like the cover of the eBook, for instance. Nothing shouts desperate wannabe-writer like a cheap cover. Now, living in South Africa, I knew I’d have to dig deep, but I made sure I got an award-winning artist to design my cover. I got a quote from Ben Baldwin and sent him a few stories I was planning to add to the collection. That way we could both discuss what would be the best possible cover. While Ben was working on the cover, I thought about the stories I would include. A few would be previously published, but the majority needed to be unpublished, brand new material. The final tally is twelve stories. Just remember to choose your stories according to a theme. Some writers and anthologies prefer topics like zombies, or vampires, I prefer deeper themes like death or jealousy. The theme for my collection is lost hope and man’s struggle to retain it. Originally I was looking to upload the eBook to Amazon back in April, but then I got some really positive feedback from other writers and my growing support of readers about the cover. It made me realise that I really had to write a few more stories in order to release this collection in print format as well. If you’re only looking to e-publish, word count isn’t that important. Print books shouldn’t be less than 40 000 words, as it just doesn’t look worth its cover price. But, before I get ahead of myself, what about learning how to format an eBook. This is something that has given many a writer headaches. I immediately, thanks to the great advice of my friend Nick Daws, bought the ‘Formatting and Publishing on the Kindle by David Robinson’ eBook. I put all the stories I had so far, including the index, into one document and formatted it as I worked through the book. I’m also reading the ‘Smashwords Style Guide’ eBook at the moment. But, it’s nice to have someone ready to help in case something goes wrong. I have a few friends who can help out with formatting, and one who will help if I struggle uploading onto Amazon. Make sure you have some kind of backup, especially if you’ve given yourself a deadline like I have. Now when it comes to the price, there are a few things you need to know about Amazon. Amazon of course takes a cut, but the size of their cut depends on the selling price of your eBook. From what I’ve heard, anything less than $2.99, you get 35% royalties. Between that and $9.99, you get 75% royalties. Anything higher than that returns to 35% royalties. So make sure what you want to ask on the launch day, but remember, you can always change it later. And don’t forget, you have the option of selling on Smashwords or even from your own website, if you know how. Just remember to read Amazon’s terms and conditions first, especially when you want to sell eBooks from another outlet. Any writers living outside the US also needs to register for an EIN number, otherwise the Amazon, Smashwords or Createspace will take an additional 30% for tax purposes. · A Blog tour two days before and 5 days after the launch. · Just showing the cover on various Facebook pages and websites already created lots of buzz. · Calling in support from friends, bloggers and folks in advertising I’ve helped over the years. There are some wonderful people out there who are always willing to help out. Just remember to return the favour. 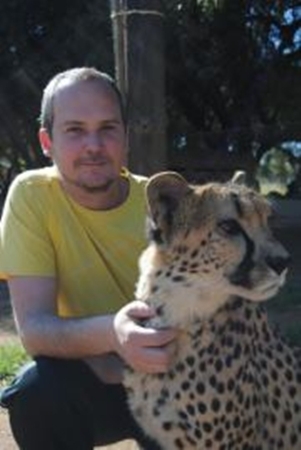 · I’ve recruited a couple of readers and writers alike to work on Amazon reviews. They’ll each get a free copy a month in advance and upload their reviews the day of the launch. · I’ve sent the stories to a dear editor friend of mine who is much better at spotting mistakes than I am. She will of course promote from her side as well, just like the other people who helped bring this entire project together. And who knows what idea I’ll come up with next. Maybe you have a great idea you’ll share with me. All I know is, if I rushed this, I wouldn’t have thought of any of these ideas. I’m even working on a special event for Halloween. But, always remember this, the stories are the most important factor here, be it a collection of short stories or a novel. You can promote as much as you want, but if you’re story isn’t the best it can be, forget about it. Also make sure your next book is better than your previous. A month or two ago I became so overwhelmed with all these marketing strategies and formatting guidelines, that I almost suffered from writer’s block. Perhaps I was feeling the pressure of not giving the readers what they thought they’d get. With such an amazing cover, the reader will be expecting the same quality on the inside. And it is a scary thought, one every writer needs to face. We are putting our words out there for people to judge. Don’t think every reader will be happy. Don’t think every review will be positive. As long as you know you did your best and took no shortcuts, words shouldn’t hurt you, and you shouldn’t let them. Jack also recommends the ‘Publish on Amazon Kindle with Kindle Direct Publishing’, free on Amazon. “On your first day live on Amazon, you can expect your initial sales to be to friends and family. After that, sales will slow to a crawl or, more likely, stop completely, and the reason for this is as a new, unknown, author your book has no profile; it's just another indie book amongst a sea of indie books. This is the time you have to start promoting your book and, more importantly, yourself. Facebook and Twitter accounts are essential, as is a blog. Use Twitter to advertise your book page on Amazon, although bear in mind that every other author on Twitter is doing the same too, so realise you'll just become part of the noise. In my experience using Twitter in this way yields very few, if any results. A better way to use Twitter is to use it to drive people to your blog. Your blog should be entertaining and reflect the kind of writing people will find in your book. Make sure your posts have the widest possible appeal. For example, if your blog is about food and recipes, include anecdotes about when you first discovered the particular Recipe, Food, Wine etc. You want your personality to shine through your posts, so people can get to know you and, hopefully, like you enough to become a subscriber. If someone likes your blog enough to subscribe to it, chances are they are going to be interested in looking at your book, so make sure you have a visible link to your Amazon book page for both the UK and US sites. If your market is likely to be in France, Germany, Spain or Italy, then include links to the relevant sites also. Leeds Central Library goes Steampunk for the day. Sam Stone, David Howe and Raven Dane will be attending this event. Books will be on sale along with many other Steampunk goodies. Address: Leeds Central Library, Calverley Street, Leeds, LS1 3ES. Date: Sat 4th August 2012. 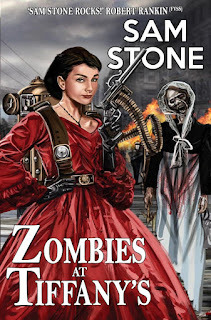 Sam Stone and David Howe join the guest line up at the Steampunk event of the year. See the website for further details and updates. Tickets sell quickly for this event so order yours now! LLANDUDNO WRITERS WORKSHOP 12th September 2012. Sam Stone will be presenting a writing workshop to Llandudno Writers Group. This is a closed event involving group members only. WATERSTONES ARNDALE CENTRE MANCHESTER, 15th September 2012. MANCHESTER VAMPIRE GUILD MEET-UP, Manchester, 16th September, 2012. Sam Stone and David Howe will be revisiting this super store in Wigan town centre. WALES COMIC CON, Sunday 23rd September 2012. Sam Stone and David Howe join the line up of guests for this increasingly popular event. Come along and meet stars from your favourite TV shows and films. Sam Stone and David Howe will be attending Grimm Up North Festival this year as guests. More information to follow on this. DERBYSHIRE STEAMPUNK FESTIVAL, Sat and Sun 13th/14th Oct.
Sam Stone and David Howe will be guesting at this event. Address: The Grand Pavillion, Matlock Bath, Derbyshire. WATERSTONES LLANDUDNO, Sat 27th October 2012. Sam Stone and David J Howe are happy to be returning to Llandudno Waterstones this year with their new books. Date: Sat 27th October 2012. WATERSTONES BOLTON, 3rd November 2012. Sam Stone and David Howe will be revisiting this super store in Bolton town centre. 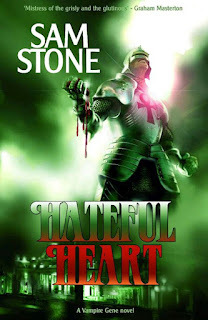 Recently I have been contacted by several of my readers because they had accidentally purchased books by 'another' Sam Stone on Kindle, only to discover that they weren't mine. Anyway, please be aware of this when you search Amazon for any of my titles. If you're looking for crime then the 'male' Sam Stone is the one you want. If you're looking for Horror and Fantasy then that's me - and I'm female! I have also never written any self-help, relationship, or religious books. 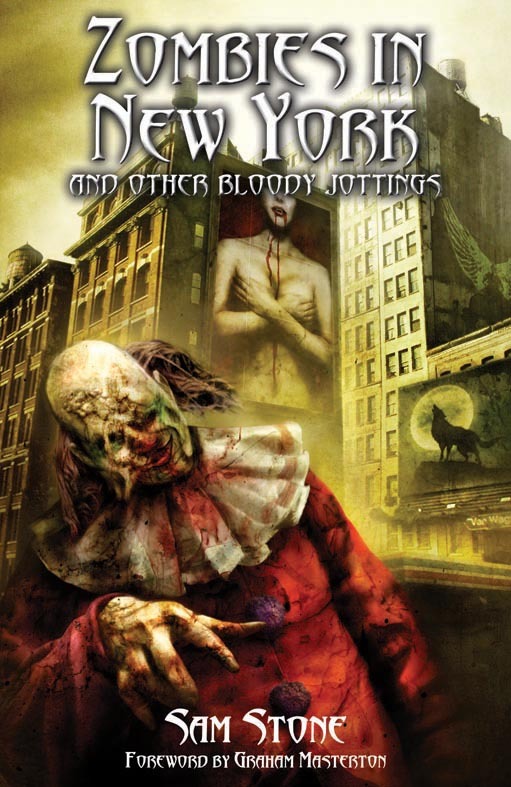 Free for just 24 more hours ... ZOMBIES IN NEW YORK AND OTHER BLOODY JOTTINGS on Kindle now! Today only! Contains the 2011 British Fantasy Award Winning short story 'Fool's Gold'. For the next few days you can download a copy of Hateful Heart for just £0.77 on Amazon.co.uk or $1.20 on Amazon.com. Lilly, Gabriele and Caesare's vampiric life at Rhuddlan Castle is disrupted by the arrival of Amalia: a new vampire created by Lilly's one-time companion, Harry. They learn that Harry is dead, killed by some powerful weapon wielded by the mysterious time-traveller known only as Carduth. Realising that their lives are now in peril, the quartet begin an incredible adventure through time and space. They must track down Carduth, and somehow disable the weapon, before they too succumb to its fatal effect. GRIMM UP NORTH, VAMPIRE SUNDAY, Manchester, Sun 22nd July 2012. This week I'll be at Grimm Up North's VAMPIRE SUNDAY event. Starting the day with a reading from my new novel, SILENT SAND, and a Q + A session. Join me for a day of Vampire Favourites. 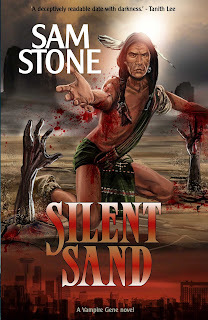 Pre-ordering has now commenced for ZOMBIES AT TIFFANY'S and SILENT SAND and I'm delighted with both covers too. These are the handiwork of artist MARTIN BAINES. Both novels will be launched at THE ASYLUM 2012 in Lincoln town centre, 6th-9th September 2012. This is 'the most splendid Steampunk festival in the world'. 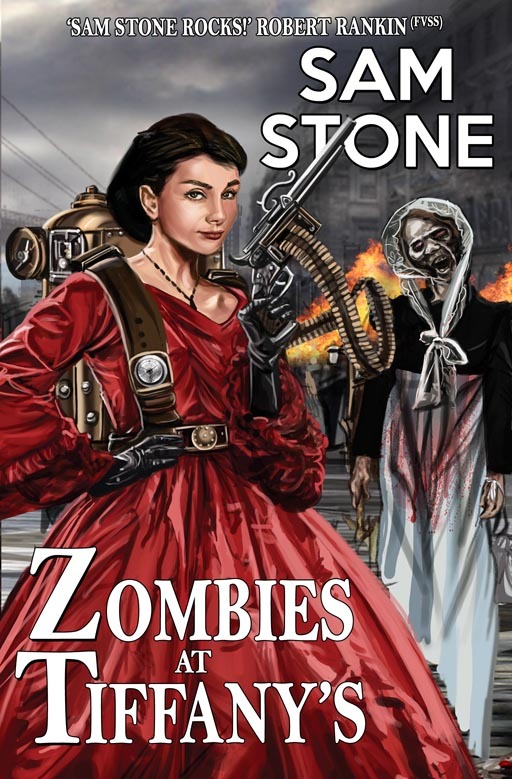 ZOMBIES AT TIFFANY'S - Steampunk/Horror Novella. 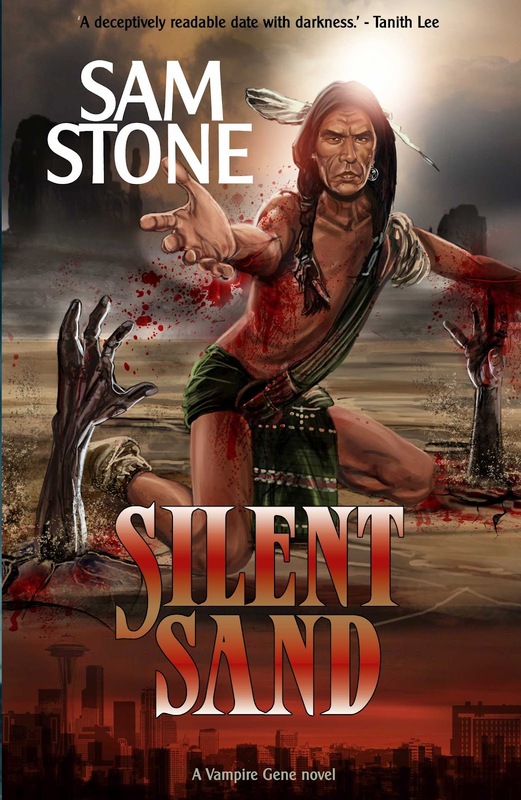 SILENT SAND - A Vampire Gene Novel. Lilly thought that her vampire lair under Rhuddlen Castle in North Wales was safe … until the dangerous fixer Darren Preacher tracked it down. When Preacher brings Gabriele into the CIA base, Lucy fears her cover may be blown, but there is something far more dangerous than vampires hiding beneath the sands of Nevada … something ancient and vengeful, with an eternal patience and a lust for revenge. ALL PRE-ORDERS WILL BE SIGNED AND DEDICATED. Following my outburst yesterday - about the Governments plans to bring in a bill that will effectively pirate the copyright of creative people - a petition has been raised to show our displeasure. I don't need to express how important it is that we do not become complacent at this time. Although the government are saying that this bill will help to make 'orphaned materials' available for public consumption, the implication is that a blanket bill on copyright will effectively mean that unless you 'opt out' your works may be 'seized' and sold on to a third party - who will then be able to exploit them in anyway they wish. This might, and probably will, mean that the owner of the materials will not earn anything from this. But presumably the government will. It has been said to me that merely stating your copyright ownership on your works is enough to protect you (Via a USA copyright lawyer). I am in doubt about this ... it will depend a great deal on the legal jargon used in the bill no doubt. I don't trust these guys - do you? My feeling is that this may not be the case, and we have to assume that the need to 'opt out' that is being imposed on the bill is being put there as a legal loophole. If you don't opt out for example, but declare copyright on your work, does this mean they can use your complacency against you? Who knows. But much clarification is going to be needed before I'll be convinced that my works are safe. If you agree, or are worried at all then I urge you to sign this petition. At the very least I would like to see something that protects us put into the bill - without the need to opt out. Today it was brought to my attention that the government is pushing through a bill to take away the legal rights of artists, writers and photographers. Effectively the government are enforcing a legal snatching of our copyright and it is down to the author, artist or photographer to 'Opt Out' before the Government then allows their copyrights to be exploited by third parties. The third party can then legally use your works in any way they wish and make a profit from doing so. It is unlikely that you will receive any money at all of this. The Intellectual Property Office have posted an update that seems to confirm that the government have drawn up a policy statement Consultation on Modernising Copyright. I am furious that creative people are again being abused in this way. It seems to me that everyone in this world is entitled to be paid a fair amount for the work they do: except writers, artists and photographers. Would David Cameron work as Prime Minister for months without being paid? Would a solicitor even work for one hour unpaid? Would you go to work and spend weeks doing your job without being paid? Of course not. It takes me months to write a novel so why then should I work for free? Why should any professional work for nothing? How are we expected to pay our bills? Feed and clothe our children? Do they think because we are creative then we don't need the basics to live? This government has severely disappointed me on every level in the last twelve months. Not only have they taken away our NHS, they are also stamping on our rights at every opportunity. We've spent years fighting off the pirates who steal our work on the internet and now the government comes along and just tries to take it all. This is 'legal piracy'. And we can't let it happen. Our country is turning into the vision that George Orwell had when he wrote Nineteen Eighty-Four and our government is so reminiscent of Big Brother. What will be next? The 'Thought Police'? And dare we ask who the 'third parties' will be? I assume it will be those who bid the highest and give our officials the financial - somehow 'legal' - bung that they will get for selling on all of our hard work. So it will be companies set up and run by the already rich and bloated mega-corporations who already own and run most of the outlets for creative work - they are those with most to gain by being able to exploit anything which the copyright owner has not opted out of. Will I allow this to happen? NO. My intellectual property and copyright belongs to me. I claim my copyright. If you want to use my words - then you come and pay me the going rate like everyone else. Otherwise, government or no government. You're not using it. Final. But if we all stand together, then this Legal Piracy can be shown up for the 'theft' that it is. Sometimes when you try to do the right thing, the odds seem stacked against you. That doesn't mean you shouldn't try in the first place. It takes great wisdom to back away from a bad situation, and realise that your best was all you could do. 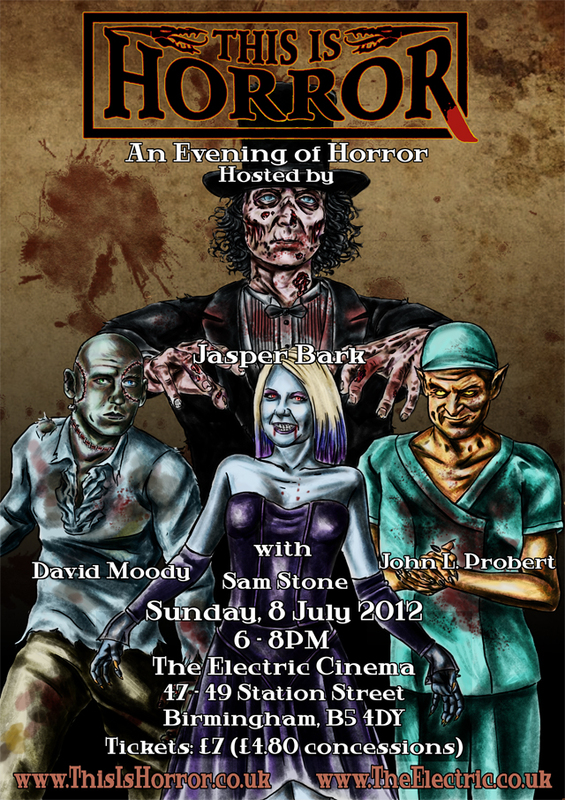 I just had to share this new poster for the This Is Horror Literary Event at the Electric Cinema in Birmingham next Sunday 8th July. This event is part of the Shock and Gore Festival. Don't forget from 6pm-8pm Jasper Bark will be hosting readings and a Q and A session. If you've seen my earlier post you'll notice there has been a slight change of line-up and so I'm pleased to tell you that the awesomeness that is John L Probert will now be joining David Moody and I. Or visit Shock and Gore to book your tickets now.